The 200 mile gravel grinder in the Flint Hills happened on Jun 2nd. The results are amazing to me--the fastest folks average over 19 MPH for over 10 hours on Flint Hills gravel in Kansas heat & humidity! Fastest time was 10:44:22. 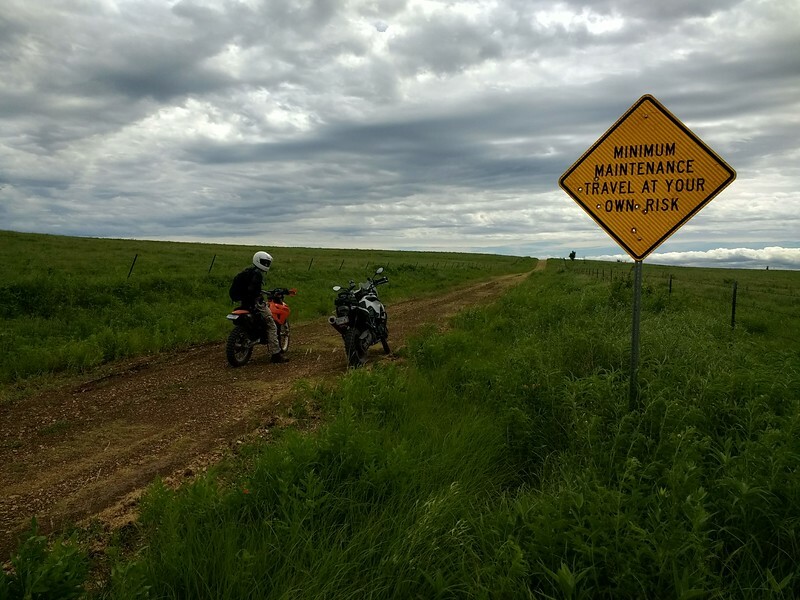 I've ridden my motorcycle 200 miles in the Flint Hills and did not go much faster on average. Sure, I took longer, food, water, and photo breaks, but wow. The route has been shared and would no doubt make a great dualsport day. I think the route is all public roads, but...maybe they got permission for some private bits. On Wednesday, I took a very good friend of mine riding in the Flint Hills. He is a noob to off-pavement motorcycling, so I did not want a group along in order to keep him comfortable. 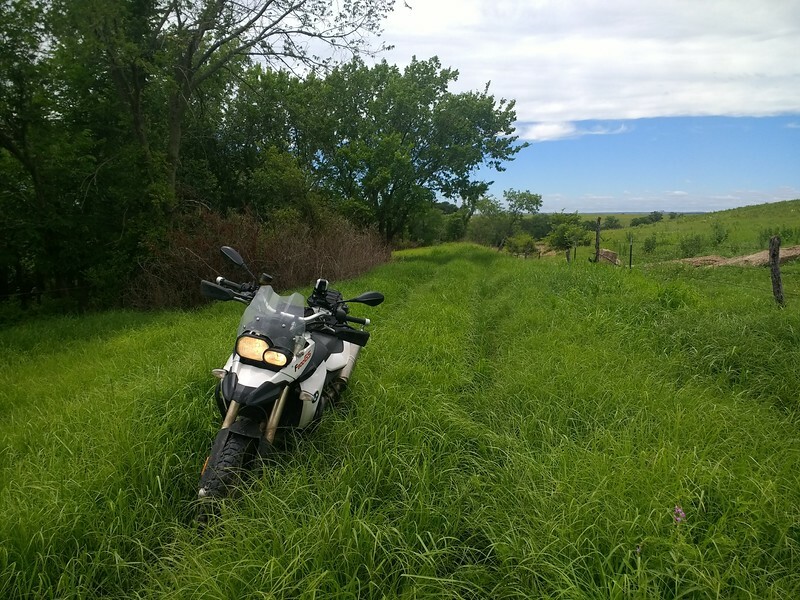 We took both my BMW F800GS and KTM 500 EXC. I put him on the 500 since it would be easier to handle in the gravel and rough stuff, although it was sure to wear him out from the rough ride and vibration! 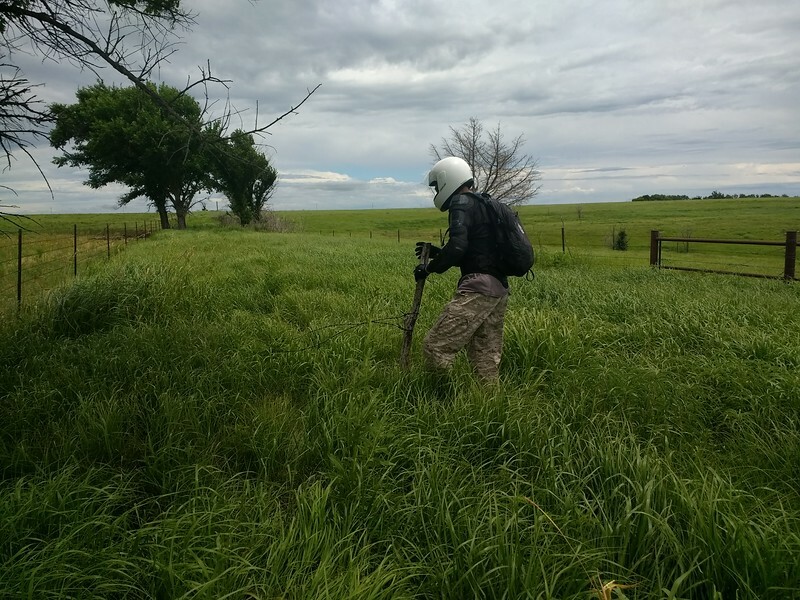 Our plan was to explore all 200 miles of the Dirty Kanza route. About 50 miles in, we realized my friend was not going to endure 200 miles of this! I cut out about 70 miles of the South loop making for a 132 mile day. We had near perfect weather. We were actually a bit chilly a couple times. It barely sprinkled on us, which was welcome to keep the dust down. From that parking spot, you hit gravel in less than 1/2 mile. Very quickly the route got scenic and twisty--like you expect for Flint Hills gravel. 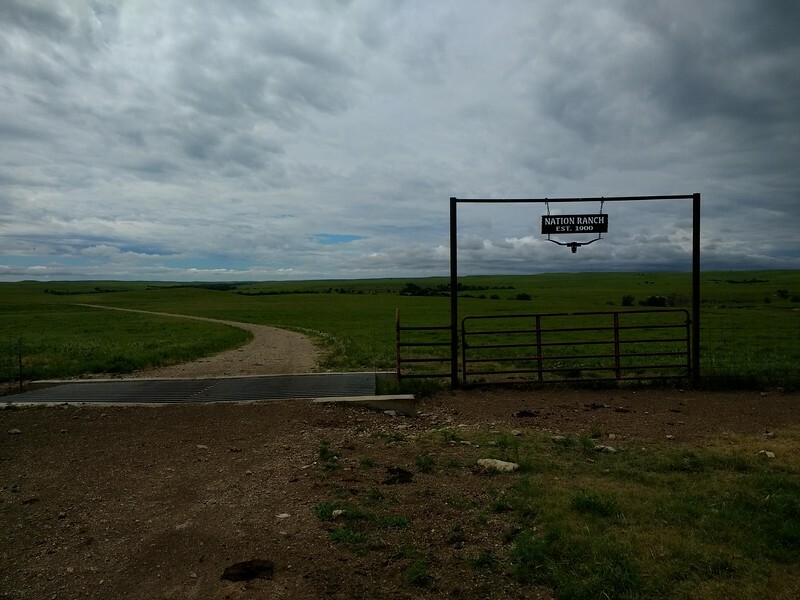 The bit of road running down to the Bazaar Cattle Crossing and the road that continues from there S through Nations Ranch was a highlight--just stunning open range views with a road that carves back and forth and up and down. There was one gate to open before we got to Bazaar (I-35). The road heading S into Nations Ranch at the Bazaar Cattle Crossing has a new sign reading "Authorized Vehicles Only". It is a white sign that looks like a government sign. The road, however, is very well traveled. I'm not sure it was totally legit to ride, but I suspect that sign was to appease the locals when the state recently turned that cattle crossing into an official scenic outlook with a parking lot and trash cans. I think the sign is to keep most folks from wandering down there. I'm pretty sure that road is how the small handful of families that live a few miles from there get out to the highway. In any case, nobody yelled or fired guns at us. Then again, we didn't see anyone. We did see a whole lot of cows in the road, though. They looked delicious. The route included a lot of your good ole standard minimum maintenance roads that would surely be sticky when wet. I was a bit surprised at how much run-of-the-mill, wide, maintained KS gravel there was in the route. Years ago I did a 200 mile day starting and ending in Cassoday, and rode "remote Flint Hills roads" the entire day as I recall. Still a great day. The plan was to eat lunch at the Red Brick BBQ & Bakery in Madison, KS. However, it is closed on Mon & Wed. We ate at the Casey's gas station. Yum. 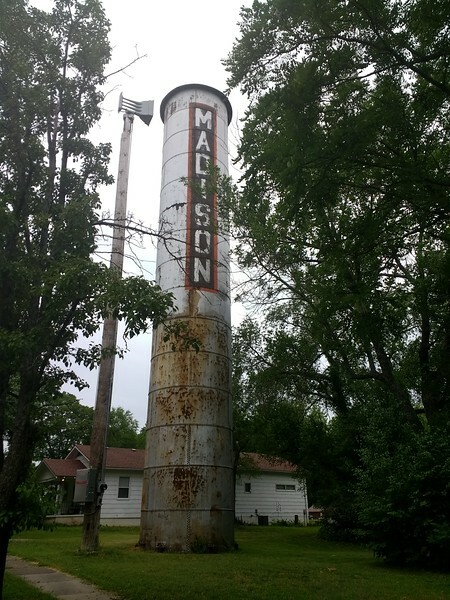 I thought this water tower looked cool. Note the official Dirty Kanza route has a bit of twisty mess at the S end of Madison that you can't ride--it's somebody's yard/field that must have had permission for the race. It's only about 1/2 mile so just skip that and head W out of town. As I'm typing this and looking at the map, I NOW REALIZE we were 2 miles from Teter Rock and did not go see it! ARGH! I've never been there! Yes, this route goes right by Teter Rock, and is basically the point where we truncated the official route and basically headed straight E to connect back to Hwy 99 before heading N back through Madison to continue on the route. Almost did not see this "gate" strung across the old road. I need to get back out there to finish the far S part of the route AND see Teter Rock. How did your friend like the ride? He very much enjoyed it of course! Cool shots and good call on making it a small group for him. 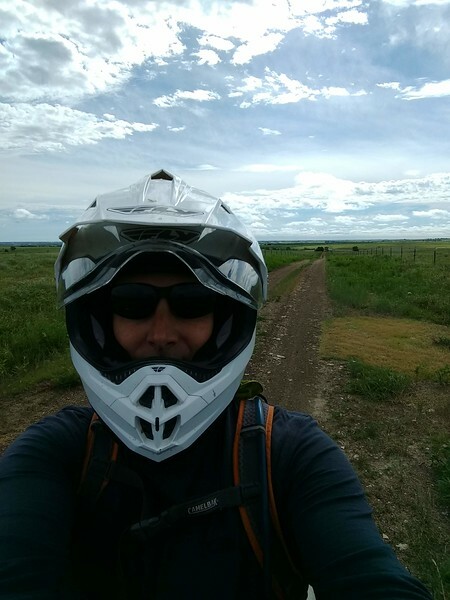 A few weeks ago I led one off road noob F650GS and a cautious KLR rider out to Alma area without taking anyone from this board for the same reason - I didn't want them stressed out. I figured we would check the status of rougher roads like Box Turtle, Rockton, Divide, and turn around if needed; but really they were all pretty well maintained compared to past years and it was bone dry. More tax money I guess. The only get off was loose gravel braking & turning. When a guy with only 60 miles of gravel riding on new-to-him bike can do Box Turtle without even a slow motion spill you know the crew has been out often. I won't say he wasn't a bit freaked out on that, but it's not an adventure without a story.